Helena High's Emily Feller looks to pass after bringing down a rebound on Thursday evening during the state tournament in Butte. Butte's Ally Cleverly dribbles the ball down the court on Thursday during state basketball in Butte. Butte's Aspen Lovshin drives with the ball on Thursday during girls state basketball in Butte. Missoula Hellgate players celebrate at the buzzer after they defeated Billings Senior in the first game of the 2019 State Class AA Girls's Basketball Tournament on Thursday in Butte. Helena's Vaness Walsh is defended by Butte's Brittney Tierney on Thursday evening during girls' state basketball in Butte. Helena's Jamie Pickens takes the ball to the hoop on Thursday against Butte High School at the 2019 Girls' Class AA State Tournament in Butte. Butte's Brittney Tierney squares up to shoot a three-pointer on Thursday evening during the state basketball tournament in Butte. Hellgate's Perry Paffhausen pulls down a rebound on Thursday afternoon in the first game of the 2019 State Class AA Girls' Basketball tournament in Butte. Billings West's Shea Dolan dribbles the ball down the court on Thursday during the Bears victory in the first round of state class AA basketball games in Butte. Billings West's TyRaa Manuel takes the ball to the hoop on Thursday during the Bears game against the Glacier High School WolfPack during the 2019 State Class AA Girls' Basketball Tournament in Butte. Billings West's Shayla Montague looks to pass the ball on Thursday during the 2019 State Class AA Girls's Basketball Tournament in Butte. Billings Senior's Lily Johnson takes the ball to the hoop as she is defended by Hellgate players on Thursday during the 2019 State Class AA Girls' Basketball Tournament in Butte. 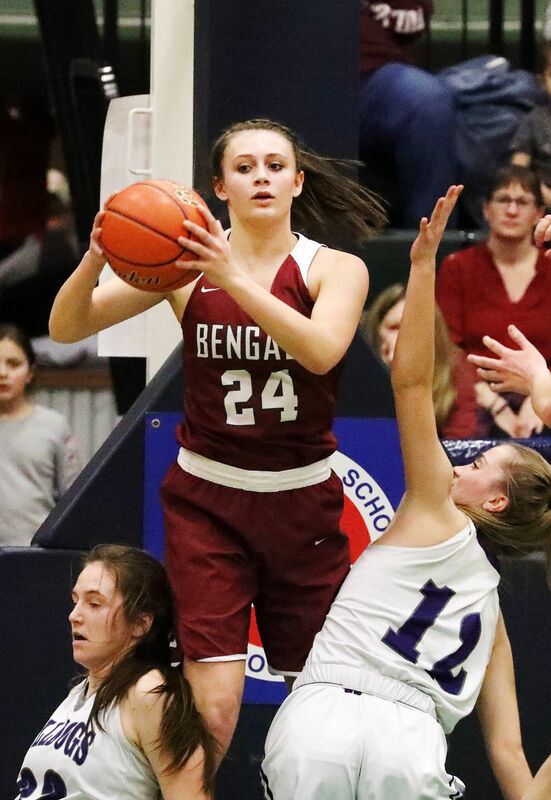 Billings Senior's Nevaeh Pretty on Top drives with the ball as Hellgates Kylie Lunday defends on Thursday during the 2019 State Class AA Girls's Basketball Tournament in Butte. Hellgate's Bailee Sayler takes the ball to the hoop on Thursday afternoon as two Billings Senior players defend during the 2019 State Class AA Girls' Basketball Tournament at the Butte Civic Center. Coverage of the Class AA state basketball tournament Mar. 7-9, 2019 from Butte.